The Neo G Stabilized Open Knee Support utilises metal spiral stays to help support the knee complex whilst still allowing controlled and flexible movement. The open patella design with stitched buttress helps with patellar tracking whilst providing added support and helping with overall stability by eliminating glide and twisting at the knee. Weight bearing pressure during movement is more evenly distributed over the joint helping with arthritic and meniscus pain. 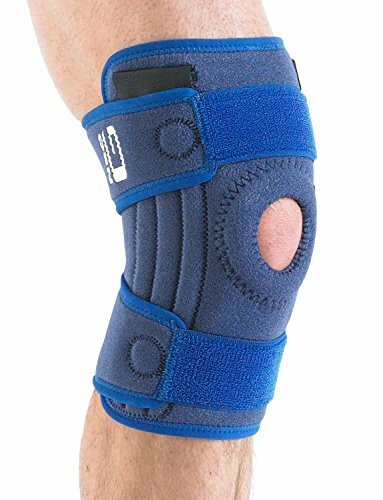 The durable, heat therapeutic neoprene helps with arthritic knees, chronic aches and stiffness. A dynamic support, ideal for occupational use, summer and winter sporting activities such as tennis, skiing, golf etc. Fits up to 56cm / 22In. Measure thigh circumference 4 Inches above knee for maximum size. If you have any questions about this product by Neo-G, contact us by completing and submitting the form below. If you are looking for a specif part number, please include it with your message.